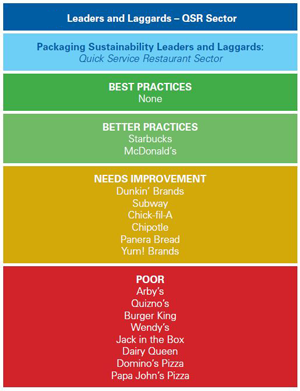 Large brands like Dunkin Donuts, Burger King, KFC, MillerCoors, and Kraft Foods are wasting valuable materials through poor packaging sustainability policies – to the tune of $11.4 billion a year. And by selling single-use food and beverage packaging that ends up littering streets or in the oceans instead of being recycled, they’re not just wasting, they’re contributing to global pollution. 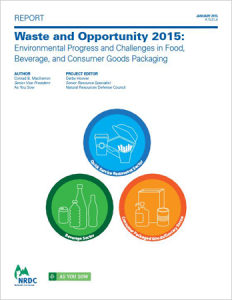 Waste and Opportunity 2015, a new report from As You Sow and the Natural Resources Defense Council, analyzes the packaging practices of 47 fast food chains, beverage companies, and consumer goods and grocery companies, highlighting leaders and laggards in these sectors. Measure the problem! The U.S. Environmental Protection Agency cannot track the generation of fast growing plastic pouch packaging. Brands should disclose production figures. What gets measured can get managed. Replace rigid polystyrene take out coffee cup lids with recyclable alternatives – also phase out polystyrene foam cups. Polystyrene has production concerns and is hard to recycle. Ensure black plastic containers are recycled through a technological fix, and promote market development to ensure a steady demand for collected materials. Brands that place new or hard-to-recycle materials on market need to fund actions to make them recyclable or work with processors to develop new, cost-effective recycling processes to ensure they are recycled. All brands need to fund new investments in materials market development, composting and modernized collection infrastructure. We ranked corporate performance in the fast food and beverage sectors, and provide a more general overview of the packaged goods/grocery sectors. What we found is not encouraging: not one of the companies surveyed managed to earn “Best Practices” status. All are failing to sufficiently recover valuable materials and protect our world’s oceans. However, some companies are wasting less than others. 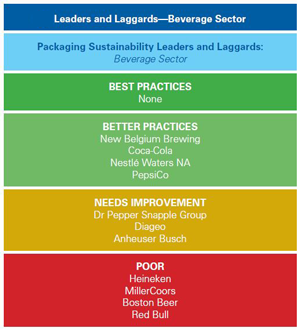 Starbucks, McDonald’s, Coca-Cola, Nestle Waters NA, New Belgium Brewing, and PepsiCo all emerged as relative leaders in their business sectors, taking proactive steps to recycle, use recycled content, or generate less waste. But as a whole, all three business sectors continue to drag their feet, failing to take sufficient responsibility for the packaging they generate. Only about half of consumer packaging ends up actually being recycled – the rest becomes litter or goes to landfill. Plastic packaging, a major contributor to ocean pollution, is the fastest growing form of packaging – but only 14 percent is recycled. Source Reduction: Switching to reusable packaging, or packaging with less material is essential to reducing virgin material sourcing. Recycled Content: Using recycled content to make new products helps create a market for recycled materials and requires far fewer resources (energy, water, raw materials, etc.). Recyclability and Materials Use: Materials that are very difficult to recycle, like flexible laminate pouches, should be avoided. 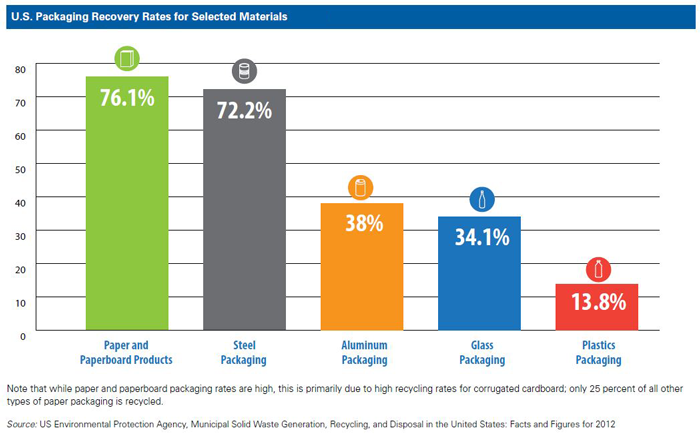 Boosting Materials Recycling: Other materials are recycled but only at low rates because of lack of bins, infrastructure, end markets, or public education. Companies have failed to do enough to ensure their packaging is actually recycled. While each of these sectors can do much more to increase recycling of the packages they produce, fast food and other quick-service restaurants are a particular concern because of the contribution of plastic packaging to plastic pollution in the oceans and other aquatic environments. Plastic litter from takeout orders — including cups, plates, cutlery, and straws — are often swept into waterways and oceans, where they partially degrade and harm marine life. The more we boost recycling rates, the more we provide opportunities to reduce the use of virgin natural resources and mitigate emissions that contribute to climate change. Yet few companies have robust sustainable packaging policies or system-wide programs to recycle their packages. That’s also a missed opportunity to create new green recycling jobs. It’s time for companies to step up and take the lead on recycling. To read the full report and see our evaluations of company performance, fill out the form on the upper left and download the PDF.